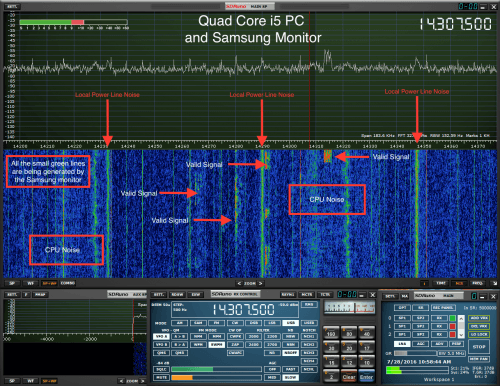 Over on YouTube user SignalSearch has uploaded a video showing how he uses an active magnetic loop antenna indoors to identify local noise sources. Magnetic loop antennas are directional, meaning that they receive best when pointing towards a signal. This means that they also receive noise better when pointed at a noise source. In the video SignalSearch uses a W6LVP receive loop antenna and demonstrates noise being emitted from his lightbulb, and from a plug in Ethernet over powerline adapter, which are known to be huge sources of HF noise. If you are interested in the noise produced by these Ethernet over powerline adapters then we did a previous post on this problem over here. One of the main tasks for an experimenting microwave amateur is to measure the Gain (G) and Noise Figure (NF) of a particular receiving device. For this one will need a Noise Figure Indicator and a (calibrated) Noise Source. There are a number of commercial devices available from different vendors at prices which will exceed an amateur’s budget by many times. A lot of them can be found on the surplus market but this doesn’t help very much. A combination of both meter and noise source is barely sold below the 2.000€ margin. Since a lot of cheap DVB – T sticks became available the idea was born to use it together with a homebrew noise source as a very cheap alternative to commercial devices . It is now possible to build a suitable solution within a budget of 100 – 200€. Using a PC with USB port for communication and power supply such a device is very compact and almost compatible to an industrial solution. Special software gives a convenient user interface. Last not least you can reuse the DVB-T stick (together with the preamplifier) as a sensitive receiver along with SDR software. To create a CANFI system you will need an RTL-SDR, a MGZ 30889 preamp, a noise source, a 28V boost converter to power the noise source and a serial to USB converter to control the noise source. 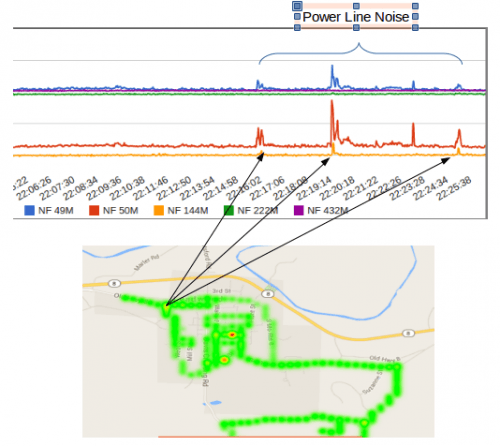 A few days ago we posted about Tim Havens “driveby” project, which is a RTL-SDR based system he developed to help create heatmaps of power line noise in his neighborhood. Upon doing further research, Tim discovered that the main source of power line interference was appearing at a frequency of 44.252 MHz. Then by using his driveby system to create a heatmap of his area at this frequency and also by using a hand held radio he was able to pinpoint a massive source of power line noise. 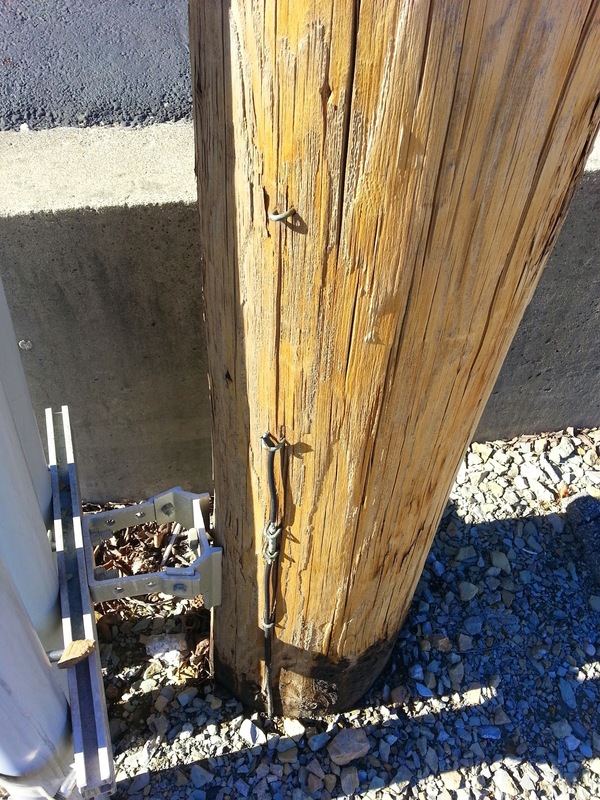 The noise appears to be coming from a faulty and unsafe power pole near a local school. 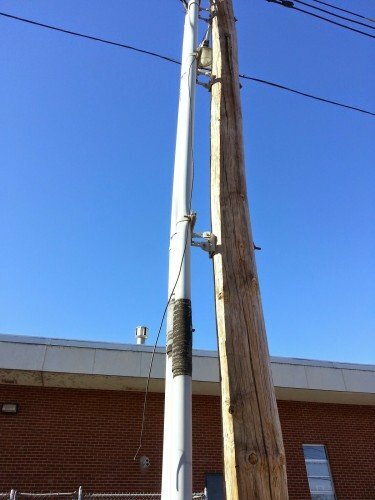 He writes that the power poles primary ground line has been severed and that a wire from the AC line is simply dangling in the air, ready to be grabbed by school children. 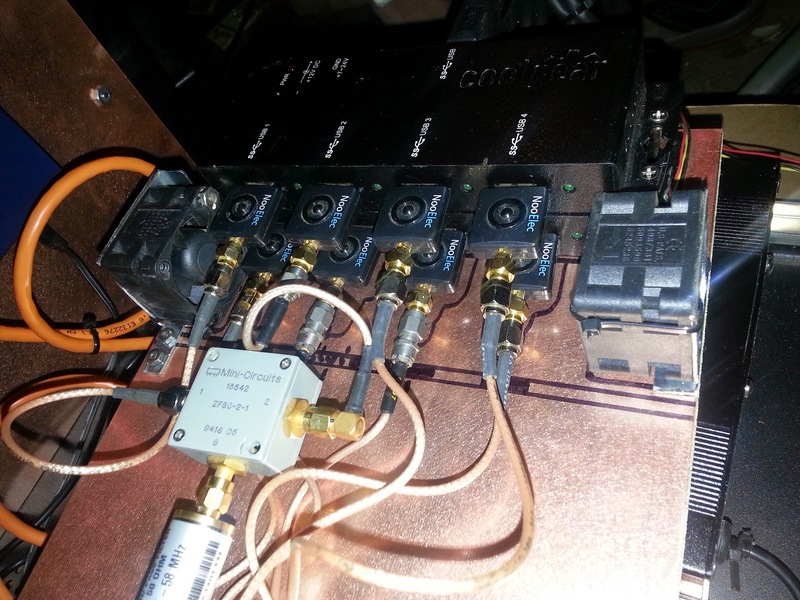 Over the last few months Tim Havens has been developing a portable RTL-SDR based scanner that he intends to use for geo-tagged noise floor readings. He hopes to use such a system to map sources of RF noise related to power lines so that he can contact his power company to resolve them. Tim’s system uses a powerful Odroid XU3 which is a Linux based mini embedded computer that sells for $179 USD. The Odroid XU3 has dual quad core ARM CPUs which is enough power to run rtl_power with 5 RTL-SDR dongles simultaneously. 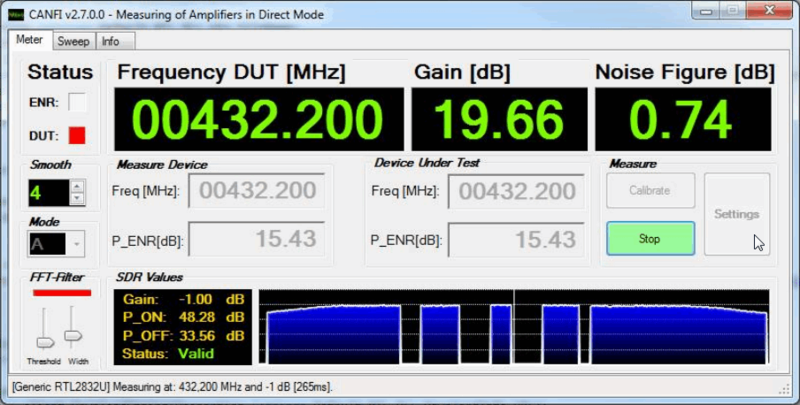 Rtl_power is an RTL-SDR tool which allows you to scan and record the power levels in the frequency spectrum. By using 5 dongles he is able to scan the 49 MHz, 50 MHz, 144 MHz, 222 MHz and 432 MHz bands simultaneously. RTL dongles are CHEAP, and reliable, although not 100% stable (they drift a bit for the first 5 minutes of warm up) they can be used to measure changes in the RF Noise Floor (once warmed up). While they don’t really seem to be able to be calibrated to anything less than -87db all we’re really looking for are relative changes to the noise floor while driving around a particular location (there is probably some complex math that could applied to these measurements that could be calibrated). So for this project these inexpensive receivers are really just fine. 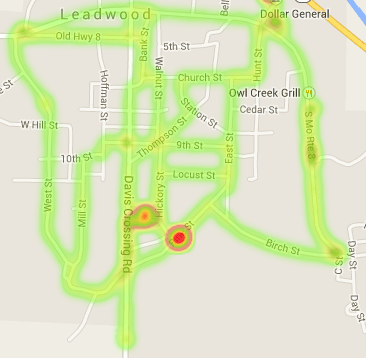 While rtl_power is scanning, the Odroid uses a GPS receiver to tag the timestamped noise readings with GPS coordinates. Then by driving around with the system and combining the GPS coordinates with the noise floor readings from rtl_power he is able to create a heatmap showing exactly where in his neighbourhood noise levels peak, indicating a power line RF noise problem to be fixed by the power company. Some more information about the hardware build of his system can be found on a previous post. Tim also has uploaded a video to YouTube showing his system running a stationary test demonstrating the hardware and some of his custom software before everything was boxed up.